Handmade arts and crafts are the flagship vendors at Spring Jamboree and are given priority placement and highlighted at this Festival. The lovely Wilbur Square is reserved for their talents and wares. This area is very shady, flat and green with easy access for load-in and out. All items for sale must be at least 51% handmade to be in this section. 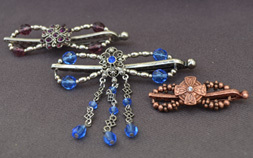 Example: purchased clothing must have hand-painted embellishments to qualify. Although this is not a juried show, the Show Committee will review all applications to make sure the correct booth option and category has been selected. You will be notified immediately if there is a problem with your application. Your booth assignment and maps will be sent by the first week of April. There will be judging and cash awards given to the winners in the handmade section. Judges will be looking for originality, excellence, design, creativity and craftsmanship. Only artists and craftsmen displaying their own original work will be eligible to be judged in the competition. Please submit 2 pictures with your application - one of your product, and one of your booth setup for review. Please label the back of your photos with your name and business name. 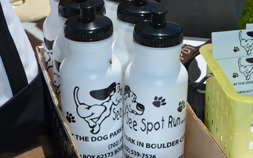 They will be returned to you with your gift bag at the Festival. Only one artist per booth will be accepted. Load-in is Friday at 6am and load-out is Sunday at 4pm. Commercial Vendors are accepted at this event and will be part of the Chamber Showcase area featuring our supportive Chamber Member Businesses. The Bicentennial Park is reserved for these businesses and is near the main stage and performing area. Pre-packaged food is accepted and a copy of your Health District permit for sampling is required 10 days prior to the show date. Only one vendor per booth will be accepted. Load-in is Friday at 6am and load-out is Sunday at 4pm. 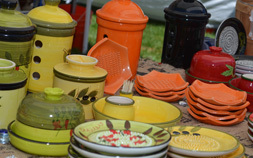 Antiques In The Park is a wonderful addition to the Spring Jamboree line-up of booth options. It too is a very shady area in South Escalante Park and is particularly an easy park for loading/unloading heavy furniture and larger items. We now offer booths that come with a parking space attached for those that leave larger displayed items in their vehicle and can display 5 feet off their parking space onto the grass. If you want this option, please note it on the application under “booth preference” and we will notify you of availability. Only one vendor per booth will be accepted. 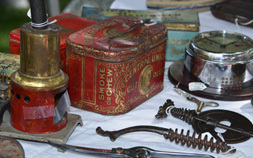 Antiques set up begins at 9am on Friday and a Show Volunteer will be in your area. Chamber Showcase~Member Vendors have the option to choose any of the booth selections, based on your category, at a reduced rate. You must be a member in good standing at the time you submit your application. We provide exclusivity for our commercial food vendors, as well as the right of first refusal to our returning vendors each year. Because of this policy, we don't make our commercial food vendor applications available online. However, we are always interested in discovering new potential vendors and so if you are interested in being considered as a food vendor at Spring Jamboree, please contact Kassie Ackerson at kassie@bouldercitychamber.com or by phone at (702) 293-2034.